Not sure if she should let go of her eggs and place them in the bag or not. At the neighborhood Easter egg hunt. The main purpose of this photo is to show off the back of her cute little dress. 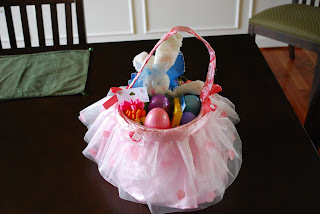 I used (ahem, the Easter Bunny used) the same basket from last year. I mean, once you find a pink Easter basket with a pink tutu around it, you know it can never be topped. (And really, how many easter baskets do you need?) Charlotte's basket had hair doodads, a bunny (plucked from a big fat collection of bunnies that her Great Auntie Cheryl had sent her a couple months ago), crayons, bubbles, and fishy crackers. Free from her church clothes! And look! The Easter Bunny left her basket in the front yard! 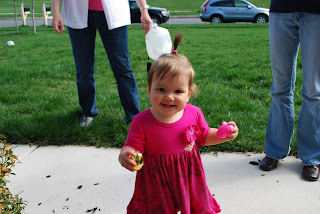 She REALLY likes those plastic eggs. 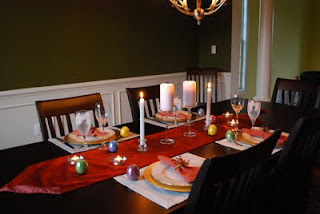 Yes, I’m posting our Easter blog a full 2 days post-holiday, but we had such a busy Easter weekend that a day-of post was not even close to possible. 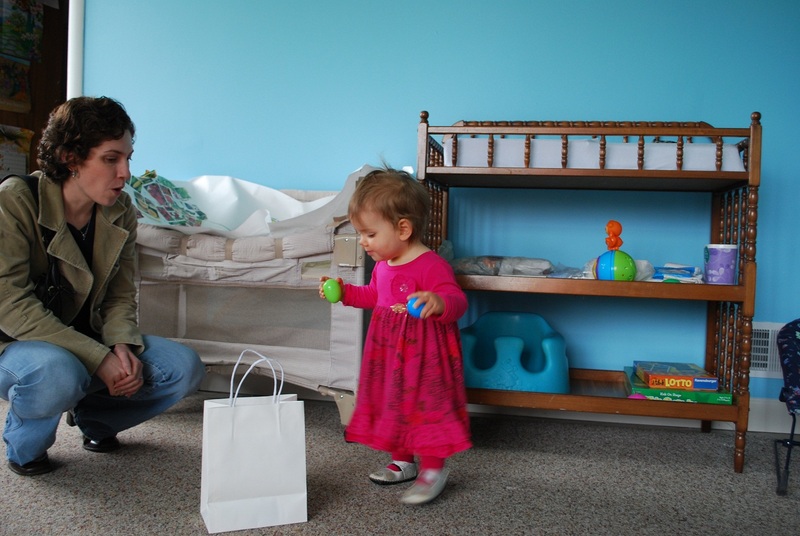 We launched Easter weekend on Friday night when Chris’s mom arrived from Nevada. We kept Charlotte up until Omi got home, and obviously she was thrilled to see her youngest granddaughter. On Saturday morning, we had egg hunt #1 at the church. Charlotte watched her first-ever Veggie Tales movie (sitting on Omi’s lap almost the whole time), and actually did quite well. 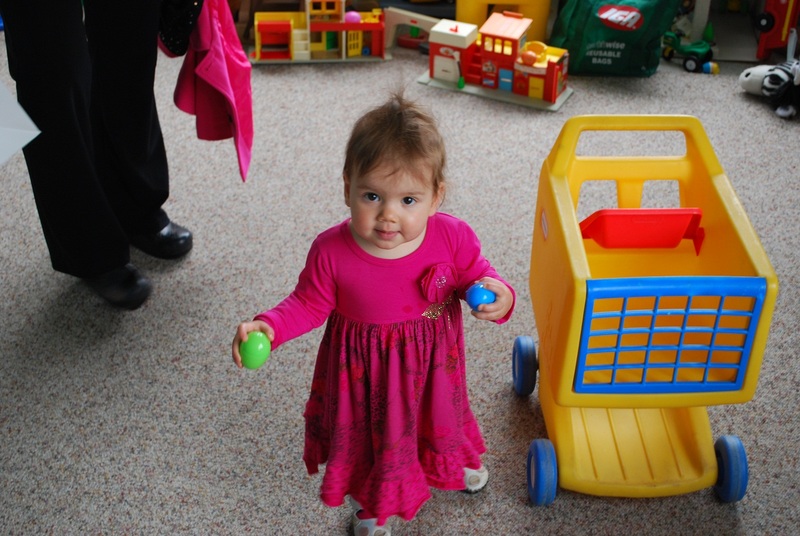 Then she had the whole church nursery to herself to hunt for eggs. Right off the bat, Charlotte knew to find the eggs. The problem? 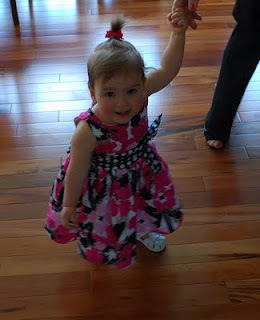 She only had two hands, and she refused to drop them into her bag (which she had decorated—along with her hands—earlier that morning). What to do? First, our clever girl tried to pick up the third egg with her already-full hands. No luck. She stood, staring at the third egg and pondering her next effort. Brilliantly, she bent down and tried to grab the egg with her mouth. Predictably, she looked ridiculous, and of course it didn’t work. 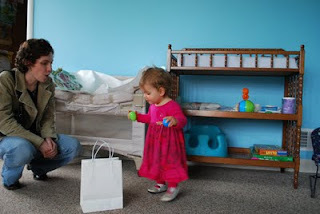 After circling the nursery in a bit of a panic—how would she ever collect all these eggs?—she finally trusted the four adults cajoling her to drop her eggs into the bag. Once she did that, our girl was on fire—she found (well hidden!) eggs all over the place. 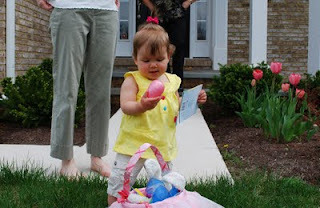 She’d find the egg and then rush to the center of the room to drop it in the bag. And repeat. Thus, by the second egg hunt that afternoon (this time a neighborhood egg hunt and potluck), Charlotte knew precisely what to do. 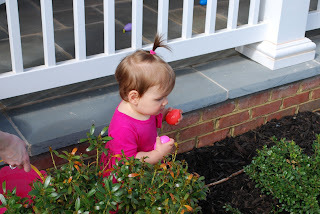 She showed her peeps (the toddler kind, not the marshmallow kind) how egg hunting was done—until she got sidetracked by the pretty bushes. Sigh. During the breakfast, the pastor took Charlotte from my lap (woohoo!) and carried her around the room, visiting the various tables. 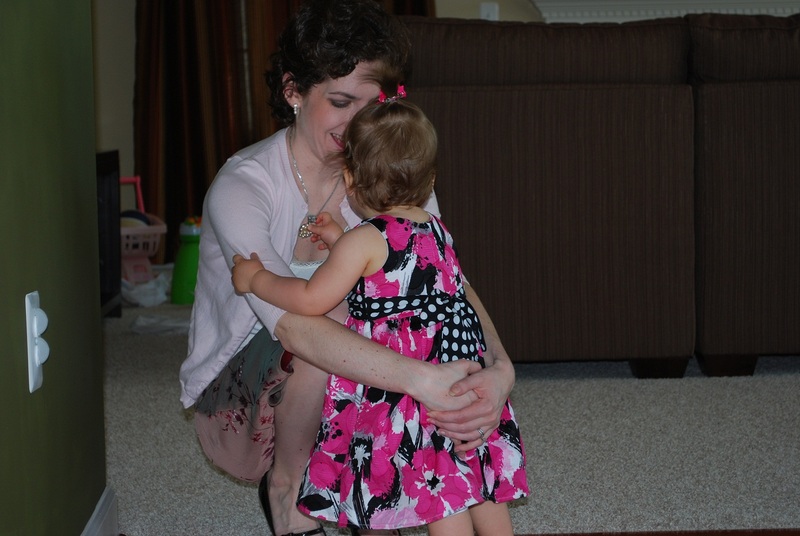 Our church is quite small, and Charlotte is literally the baby of the congregation--so she’s pretty used to getting fussed over quite a bit when we walk through those doors. We then hit the 11:00 service, with everybody in their Sunday best. Luckily, spring had FINALLY arrived, so we had lots of sunshine, which made everything extra springy and extra Easter-y. Growing up in the Northwest, I’ve had my fair share of rainy, gloomy Easters. Believe me, sunny Easters are a delightful change. Yes, sunshine accentuates symbols of new life and rebirth, but it also makes wearing white seem legitimate. I had hoped Charlotte could join us via her brand new booster seat, but the ham took longer to cook than expected, so after her umpteenth meltdown, I plopped her in the highchair, fed her something else, and then put her to bed. Lots of ham, German potato salad, green beans, mimosas, and wine later, we called it a night. And then it was Monday. They should really make Easter weekend into a 3-day holiday weekend, don’t you think?